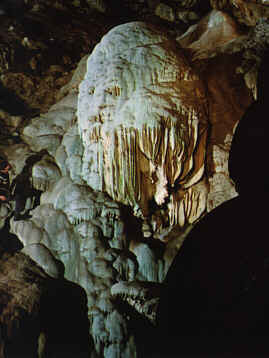 Located in the heart of California's historic Mother Lode, Moaning Cavern was first explored by gold miners in 1851. However, the cavern was long known to prehistoric people who held it in awe because of the moaning sound emanating from the entrance. On a professionally guided tour, you will descend through well-illuminated marble passages to the first level where the true magnificence of this gigantic natural wonder is first revealed. The main chamber, large enough to hold the entire Statue of Liberty and still have room to spare, will astound you! Strange shapes and figures adorn the ceiling and walls, making this a veritable treasure house of natural statuary. You will see the old entrance through which over 100 prehistoric people fell to their deaths. 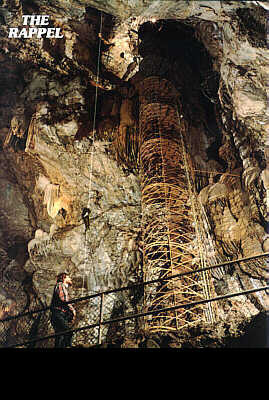 You will see where early explorers, searching for gold, daringly lowered themselves into the vast cavern by long ropes. From the first level an all steel spiral staircase descends 100 feet to the floor of the main chamber where you will stand upon the spot where scientific excavations have revealed that more than 13,000 years ago, the bodies of prehistoric men fell or were thrown into the blackness of this huge cavern. The bones, preserved to present time by the deposits of mineral-bearing waters, are thought to be the oldest human remains yet found in America. As you travel through the cavern your guide will explain the 300 million years of geologic history and tell you of the explorations that have traced the cavern downward for 410 feet, and of the new explorations in progress. You will find Moaning Cavern awesome, fascinating, and very worthwhile. Moaning Cave is located in Calaveras County between Vallecito and Columbia State Park on the Parrotts Ferry Road. Nearby are the scenic historic communities of Jamestown, Sonora, Angels Camp and Murphys, all rich in California history. While in the area, don't fail to visit Big Trees State Park, Bear Valley, Mercer Cavern and the Ebbetts Pass area. The 180-foot rope descent enters the cavern through the original entrance and descends down the sheer cavern walls. It ends about 15 feet below the visitor's platform (at 165 feet below the surface) with a ladder to climb to the platform where rappellers can join the Traditional Tour in progress. No previous rope experience is necessary. Instructions are given by experienced guides who show you how to work the gear and how it is impossible to fall. Available year round. Approximate time including the Traditional Tour is one hour. Rappellers must be 12 or older. Minors must be accompanied by an adult. Clothes may get dirty. Secured shoes are necessary. Starting with the rappel (or stairs, if preferred), the group is guided into the lower undeveloped rooms and passages below the main chamber. The trip is mostly crawlways with some passages tight enough to require a belly crawl. Knotted ropes are available in the more difficult vertical passages. The trip is strenuous! Available year-round. Approximate time 2-3 hours. Appropriate for ages 12 and older. Minors must be accompanied by an adult. One layer of loosely fitting, light-weight, grubby clothes, shoes with traction, knee and elbow pads, and a change of clothing are all that are needed. There are no showers, so a wash cloth and towel are recommended for a basic clean-up. We supply coveralls, gloves, and the helmet with light. There are no bathrooms inside the cavern, so plan accordingly. For all tours: Glasses should be secured, and long hair should be put back. Reservations and prepayment are required on all above tours except the Rappel. Discounts available for prearranged group tours. Specialized educational tours available on request.